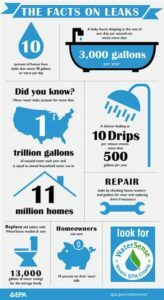 March 18th through March 24th is National Fix a Leak Week. It’s a great time to check your home for easy leaks to fix. Did you know that household leaks waste almost 1 trillion gallons of water nationwide per year? So this is the week to hunt down those leaks and fix them. Of course you don’t have to wait until this week to fix those pesky leaks and waste precious water, and spend extra money on your utility bill. Each household wastes about 10,000 gallons of water a year with leaky toilets, sinks, or other types of valves found around the house. Luckily many of these are easy fixes. For the not so easy fixes, you have a professional plumbing company like Wyman Plumbing here to help you! Faucet leaks are one of the most common culprits. Not only is it annoying to hear the drip drip drip in the kitchen or bathroom sink, but those drips add up. One drip of water per second can add up to 3,000 gallons of water wasted per year! All that water can add up to 180 showers! That’s a lot of water sent down the drain. These are some how – to video’s for some of the simple fixes. This video shows how to fix a leaking or dripping double handed faucet. This video shows how to fix a single handed faucet. This video shows how to fix a bathroom faucet. Luckily, right now Wyman Plumbing has some great deals on both kitchen and bathroom faucets. So if you do have a leak, the time to fix it is now! What better way to fix it than with a whole new faucet in your kitchen or bathroom? Get a spring spruce up for your kitchen or bath while doing your spring cleaning. So head over here and check out our great prices, and pick out something new!